The Suwon World Cup Stadium (수원월드컵경기장) is a football stadium in the South Korean city of Suwon. It has been home to K League 1 football side Suwon Samsung Bluewings since 2001. The capacity of the stadium is 43,959. Suwon Bluewings supporters "GRAND BLEU"
^ "Suwon Samsung Bluewings Official Website". Suwon Samsung Bluewings website. Archived from the original on 2012-03-08. Retrieved 2007-08-09. 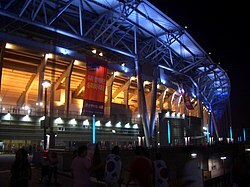 Wikimedia Commons has media related to Suwon World Cup Stadium.